We’ve known about zombie ants for quite some time, but scientists have struggled to understand how the parasitic fungus, O. unilateralis (pronounced yu-ni-lat-er-al-iss), performs its puppeteering duties. This fungus is often referred to as a “brain parasite,” but new research published this week in Proceedings of the National Academy of Sciences shows that the brains of these zombie ants are left intact by the parasite, and that O. unilateralis is able to control the actions of its host by infiltrating and surrounding muscle fibers throughout the ant’s body. In effect, it’s converting an infected ant into an externalized version of itself. Zombie ants thus become part insect, part fungus. Awful, right? To make this discovery, the scientist who first uncovered the zombie ant fungus, David Hughes from Penn State, launched a multidisciplinary effort that involved an international team of entomologists, geneticists, computer scientists, and microbiologists. The point of the study was to look at the cellular interactions between O. unilateralis and the carpenter ant host Camponotus castaneus during a critical stage of the parasite’s life cycle—that phase when the ant anchors itself onto the bottom of leaf with its powerful mandibles. By referring to the parasite’s “extended phenotype,” Fredericksen is referring to the way that O. unilateralis is able to hijack an external entity, in this case the carpenter ant, and make it a literal extension of its physical self. For the study, the researchers infected carpenter ants with either O. unilateralis or a less threatening, non-zombifying fungal pathogen known as Beauveria bassiana, which served as the control. By comparing the two different fungi, the researchers were able to discern the specific physiological effects of O. unilateralis on the ants. The results were truly disturbing. Cells of O. unilateralis had proliferated throughout the entire ant’s body, from the head and thorax right down to the abdomen and legs. What’s more, these fungal cells were all interconnected, creating a kind of Borg-like, collective biological network that controlled the ants’ behavior. But most surprising of all, the fungus hadn’t infiltrated the carpenter ants’ brains. As to how the fungus is able to navigate the ant towards the leaf, however, is still largely unknown. And in fact, that the fungus leaves the brain alone may provide a clue. Previous work showed that the fungus may be chemically altering the ants’ brains, leading Hughes’ team to speculate that the fungus needs to the ant to survive long enough to perform its final leaf-biting behavior. It’s also possible, however, that the fungus needs to leverage some of that existing ant brain power (and attendant sensorial capabilities) to “steer” the ant around the forest floor. Future research will be required to turn these theories into something more substantial. de Bekker says this work confirms that something much more intricate is going on, and that the fungus might be controlling the ant by secreting compounds that can work as neuromodulators. Data gleaned from the fungal genome points to this conclusion as well. 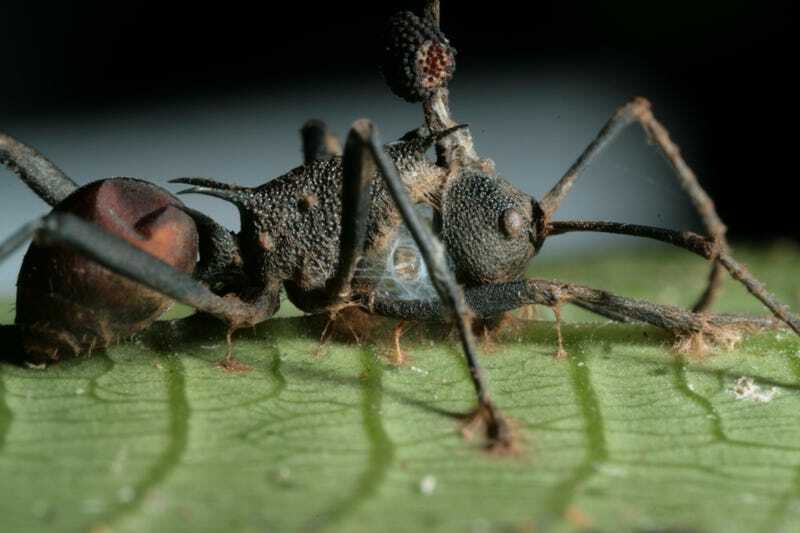 An authority on the zombie ant fungus herself, de Bekker also released new research this week. Her new study, published in PLOS One and co-authored with David Hughes and others, looked into the molecular clock of the Ophiocordyceps kimflemingiae fungus (a recently named species of the O. unilateralis complex) to see if the daily rhythms, and thus biological clocks, are an important aspect of the parasite-host interactions studied by biologists. There’s clearly still lots to learn about this insidious parasite and how it hijacks its insectoid hosts, but as these recent studies attest, we’re getting steadier closer to the answer—one that’s clearly disturbing in nature.